This wedding shoot isn’t even close to any of the winter weddings and wedding shoots that you are used to see. 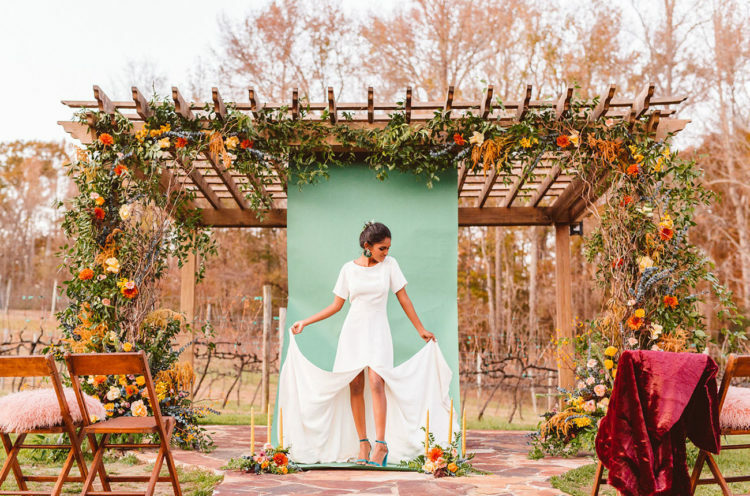 It’s full of bold colors that are more likely to be seen at fall and summer weddings but it looks so gorgeous! 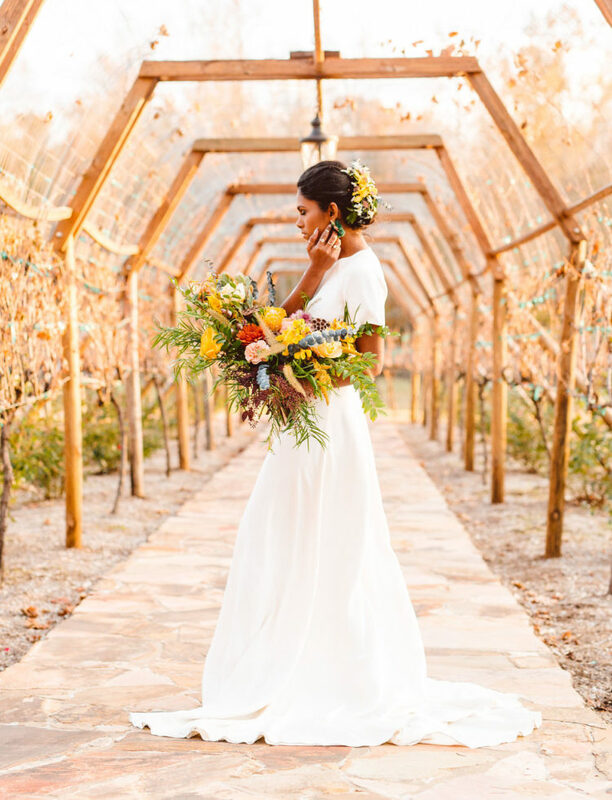 The wedding shoot took place at a vineyard, in late winter and was done with a Tuscany feel. 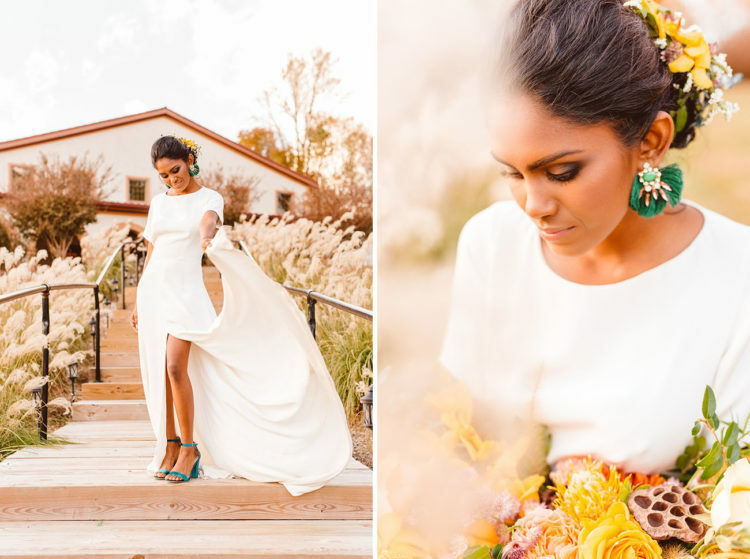 The wintry golden hour, natural textures, and open fields became a fantastic backdrop for the shoot. The stylists chose a color palette of mustard yellow, jade, and mauve, fused with the textures of wood grain, velvet, and faux furs. The not-so-subtle textured details brought an eclectic touch and added warmth to the winter day. The bride was wearing a plain short sleeve wedding dress with a front slit, a high neckline and a cutout back. I’m blown away with her adorable shoes: these are emerald velvet ankle strap heels that add a colorful touch to the look. She covered up with a faux fur mauve jacket that added even more color. 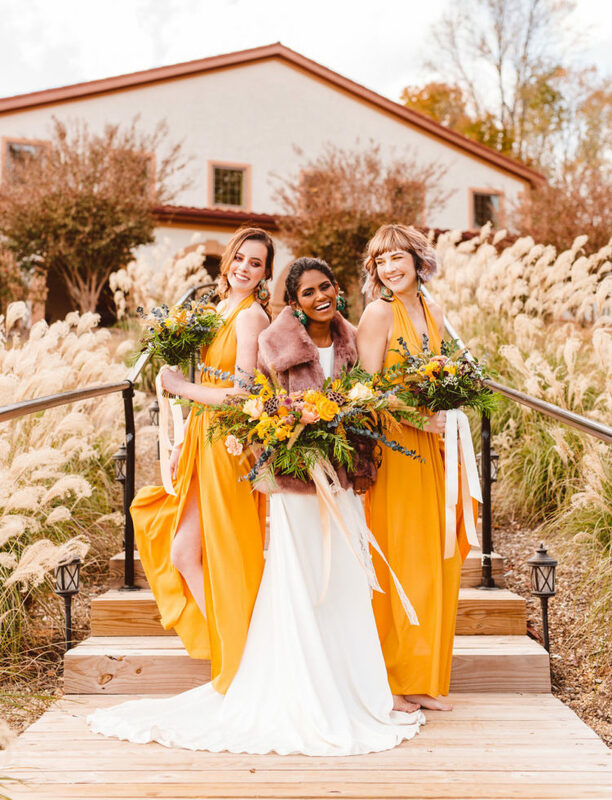 The bridesmaids were wearing mustard yellow maxi dresses with wide straps and statement earrings. 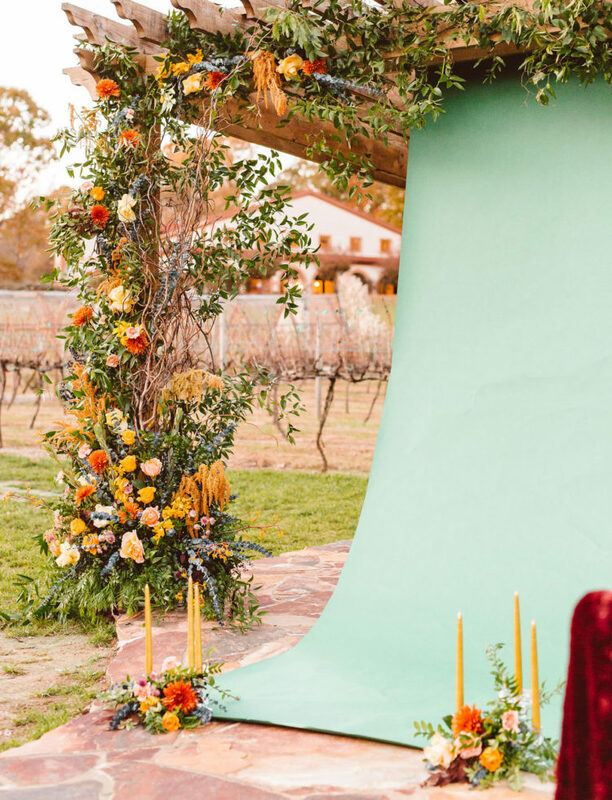 For the ceremony, the team dressed the pergola with a banner of florals and greenery, offering some colorful pops to the shoot. 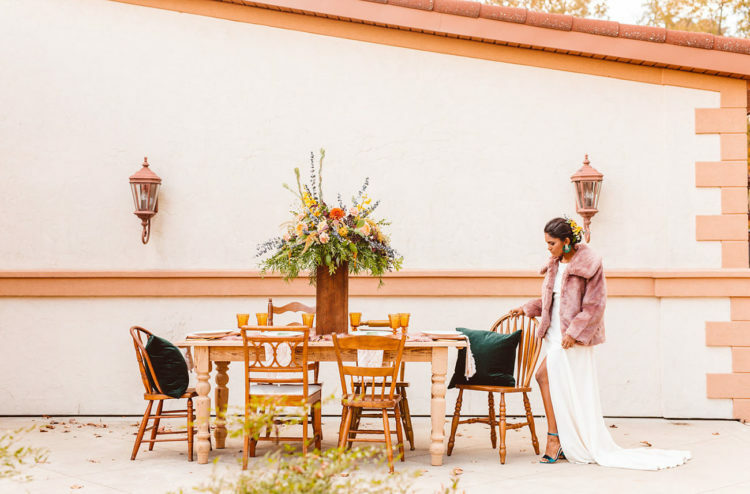 There was a bold green backdrop, and wooden chairs dotted with furry pillows and textured blankets to keep guests warm. 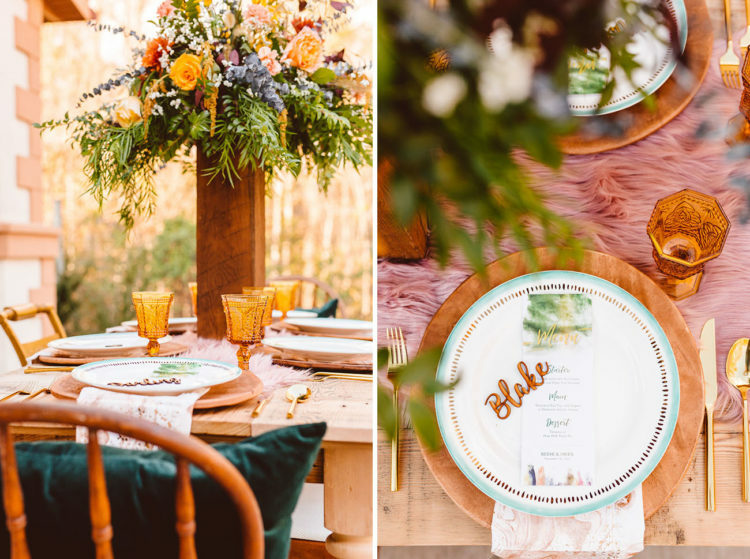 The table was decorated with faux fur, there was a stand alone floral centerpiece, printed napkins, amber glasses and emerald upholstery chairs. 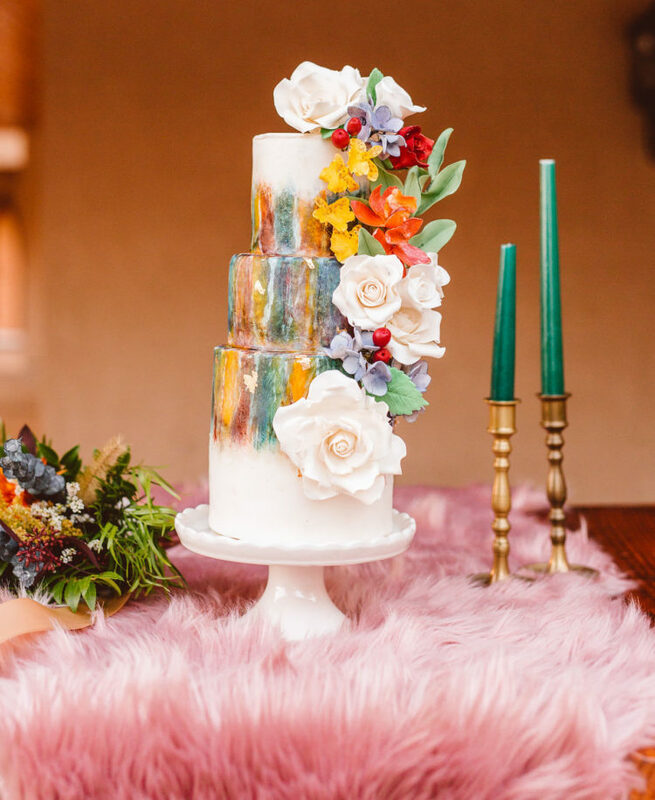 The wedding cake was a bold watercolor one in the shoot’s colors and with sugar flowers on the side.